"Dr. David G. Chandler, one of the world's greatest Napoleonic historians, is a close friend of Ben Weider, the President of The International Napoleonic Society. In the bottom photo, he is seated in one of Napoleon's armchairs, and holding the hat that Napoleon wore during the 1812 Campaign in Russia. These are part of Ben Weider Napoleonic Collection. 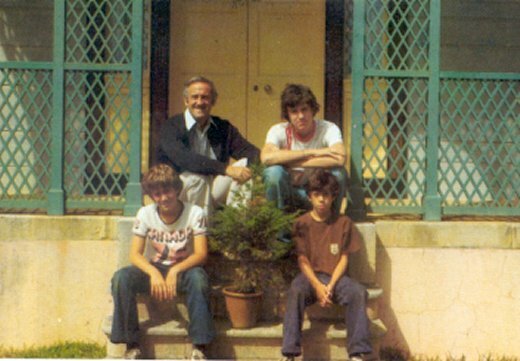 In the top photo, at top left, is Ben Weider and his son, Louis, and on the bottom part of the photo are his sons, Eric, at left, and Mark, at right. This picture was taken during a pilgrimage to St. Helena. Dr. David G. Chandler took the Weider family on a historical tour of Waterloo." DAVID CHANDLER must be one of the most significant military historians of the decade - or even of the half-century. His important The Campaigns of Napoleon has been continually in print for over 36 years, having been recognised publicly by le Général de Gaulle in 1967 and most recently by President Vladimir Putin in early 2002. Although his famous book has never been published in France and his Russian volume was only been "pirated" in Moscow, Dr. Chandler is more amused than furious by these "publishing little problems", and recovers his morale considering his various works are highly popular in UK and USA, and also amongst others in Italy, Germany, Pakistan, Korea, Japanese - and in Russia ! Early next year will show a special new edition of an amended Campaigns of Napoleon by The Folio Society of London, beautifully printed and boxed in three volumes, including all coloured famous pictures including five more new maps, a new Afterword, and a special Appendix on Napoleon's Marshals, a Supplementary Bibliography and a Preface. This must surely be "a must". Although this famous book is David Chandler's highest achievement as a writer, many more of his 27 books on Napoleonic, Marlburian and World War II volumes are still in print - including his celebrated Waterloo - the Hundred Days (Osprey & Penguin), The Military Maxims of Napoleon (coming out from Greenhill Books by next January) and his summer should include A Dictionary of Battles (Wordsworth Editions). David Chandler is a British and New American popular and esteemed author, as several will demonstrate from many important magazines. "Potted Military History" may be true or not, our friend wrote a great deal of good books, many of which are still in print. 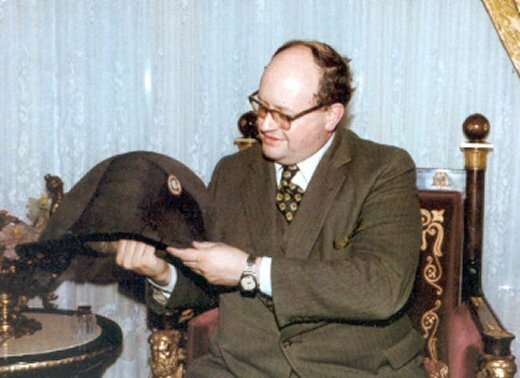 Much of his career spent around Sandhurst in England for over 33 years, becoming prestigious Head of Department of War Studies. There it is estimated that he must have taught some 25,000 Officers and Officer Cadets over this period. He was awarded two medals were the Gold Cross of Merit of Poland (1979) and the British ' National Service, 1939 - 1960'. Oxford University awarded the prestigious and rare Doctorate of Letters (D. Litt. in 1991, only five having been rewarded for military history since 1900). He has held three Visiting Professorships in the USA - at Ohio State (1970), at the VMI (1988) and US Marine Corps University (1991). He is highly respected in England, USA, Italy and Russia for military history. Besides these distinctions, he has organised in part of over 30 videos, several films on the vast BBC "War and Peace" (1971), WW2, "Remagen" (1981) and the celebrated of "Great Military Leaders". For six years he was appointed a Trustee of the Royal Armouries of HM Tower of London and Leeds. He is deeply involved into military re-enactments, and is an Hon. President of three British and European organisations. Despite of health problems, he keeps deep in touch - and spends to encourage and help new writers and artists.